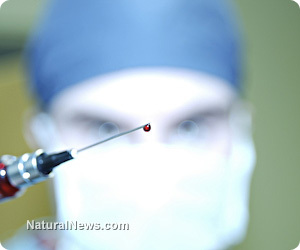 (NaturalNews) It all started with an evil, corrupt man named Dr. Morris Fishbein, who ran the "prestigious" American Medical Association (AMA) for over 40 years, and even though he had a medical degree, he never treated a patient in his life. Rather, Fishbein succeeded at controlling, suppressing and willfully crushing natural cures for cancer by using money, coercion, and the power of the AMA "seal of approval." During the time of Fishbein's reign, 1924 to 1964, the most promising cure for curing "hopeless" cancer cases was discovered by a scientist named "Royal" Raymond Rife, who created a very powerful microscope and hired and trained many scientists to work on his highly advanced "frequency" machines. Rife was quickly gaining a reputation for curing cancer patients who were on their last leg of life. Rife had already perfected and patented the most technological microscope of the era, so there was no denying his genius. By 1932, after a dozen years of designing and building cutting edge microscopes, Rife had constructed the largest and most powerful yet, magnifying organisms at over 60,000 times. With his two foot tall, 200 pound microscope, Rife could finally see live viruses. Rife and his colleagues documented precise radio-frequencies which would basically "devitalize" cell mutations and various pathogens by using a special helium plasma lamp. Rife was resented by Big Pharma and Western medicine elitists in the medical community. He hired over a dozen scientists, including Dr. Arthur Kendall, Director of Medical Research at Northwestern University, to join him in his research. This would prove to be a catapult for Rife's research and development because Kendall had been successfully using a medium developed from pig tissue to grow human cancer cells, and it turned out to be the best medium in the world. Rife was winning battles against several popular diseases of the period, not just cancer. In tests using B. coli (bacillus coli) Rife watched the bacteria die right before his eyes. One major problem was that the lamps and the microscopes were very expensive and difficult to build, so about half a dozen weren't exactly going to take over the cancer curing business overnight. Still, Rife patented the high intensity lamp in 1929 and hired an engineer to start a company which could mass produce them. Major insurance companies began contacting Rife. Timeline - The rise and fall of the "cure for cancer"
• 1932: Kendall speaks before the Association of American Physicians at Johns Hopkins University, describing preliminary successes with Rife's method. The director of the Rockefeller Institute and his cohorts vow not to support Kendall and Rife, and insult Kendall in front of audience. • 1938: The AMA visits all doctors involved with Rife warning them: "Those who don't stop using the Frequency Instruments lose their medical license." Doctors immediately turn in their Rife Machines for fear of indictment. • 1945: Dr. Milbank Johnson dies under suspicious circumstances; two federal inspectors conclude that he was likely poisoned. Johnson was about to report all of Rife's findings to the AMA the NEXT DAY. All of Rife's records are destroyed, including his academic committee records. • 1985: The Sloan-Kettering Cancer Institute finds the Rife-Livingstone organism (virus) in all blood cultures of cancer patients. They conclude that the organism comes from outside contamination and bury the report. • 2012: National Cancer Institute (NCI) is currently spending over $1.2 billion annually to bury natural cures. This does not count the monies raised by the American Cancer Society (ACS), which has the same goal. The Morris Fishbein reign is still running amuck, even though he's six feet under and has been for some time. The AMA and the FDA are still "burying" anyone who can cure cancer, but at least the truth is out there! 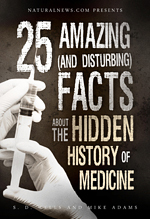 the shocking history of psychiatric medicine and much more.